Every student who begins graduate school for the first time is faced with challenges. They encounter a new community of people and rigorous academic expectations. For first-generation graduate students, there are often added challenges and struggles. A first-generation graduate student is someone who is in the first generation of their family to earn a bachelor’s degree and is now pursuing a graduate degree. Common challenges that first-generation graduate students may encounter include imposter syndrome, self-doubt, feelings of isolation, or uncertainty. Know that you are not alone. First-generation graduate students often report feelings of isolation. 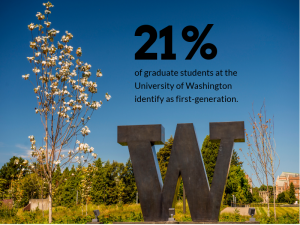 But you are not alone – 21 percent of graduate students at the University of Washington identify as first-generation. The First-Gen Initiative at Core Programs is dedicated to fostering a sense of community among first-generation graduate students. Interested in getting to know other first-generation students? You can attend one of their events! Fight imposter syndrome. Imposter syndrome, the feeling of not belonging in academia, is common among graduate students, especially those who are first-generation. When you are surrounded by peers who have impressive credentials, it can be very easy to feel that you somehow do not fit in with your cohort. Do not lose sight of your own accomplishments! Acknowledge your strengths. First-generation graduate students have strengths to draw on. Being the first in your family to graduate from college demonstrates persistence, grit, commitment, passion, and the ability to overcome circumstance. All of these strengths are useful to students as they navigate graduate school. Find your people. Connecting with people who share your experiences based on your identities or shared interests can decrease feelings of isolation and help you maintain a healthy perspective. This might look like joining an intramural sport, volunteering at a local organization, playing board games or video games with friends, or spending time at the Q Center, Kelly Ethnic Cultural Center, or Student Veteran Life. Make time for yourself. Do not feel guilty when you take time for yourself. Make room in your schedule to go to the gym, cook a meal, spend time outdoors, or watch a movie – do something that brings you joy!